“Now this is it: we’re grounded, with only our wit and our will to save the world”. So Samuel L Jackson’s, ex-director of SHIELD, Nick Fury states in the new Avengers movie, set to be one of the biggest films of the year, and among the best. When confronted by Ultron, an artificially intelligent robot accidentally created by Tony Stark, the Avengers have to team up once again to prevent global destruction and the extinction of mankind. And it’s so much fun. Unlike Avengers Assemble, director Joss Whedon assumes an informed audience – if you’re going to watch this, make sure you know what happened in the last Avengers film and Captain America: The Winter Soldier. It’ll make life a lot easier and you have a valid reason to watch those (very excellent) movies. Again. 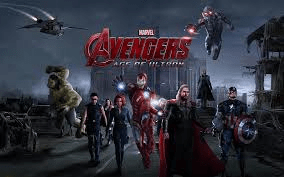 Age of Ultron throws us right into the action with a visually stunning and generally entertaining action sequence, seeing Captain America, Iron Man, Black Widow, Hawkeye, Hulk and Thor storming a Hydra base in Eastern Europe. We get a nice sequence of domestic-avengers, celebrating their victory in Stark Tower before the festivities are broken up by Ultron, a trashed robot singing a spine chilling rendition of “Got No Strings To Hold Me Down”. From there it’s all fun and games as the team try to stop the megalomaniac but strangely charismatic tyrant wanna-be from destroying humanity. While Iron Man, Captain America and Thor all have their own films apart from Avengers Assemble, Age of Ultron is a good chance to expand some of the other characters – Hawkeye/Clint Barton becomes more than a background puppet, with a bit of a look into his life outside SHIELD, and we’re let into a few secrets about Black Widow/Natasha Romanov’s early life and training for the KGB. It’s really satisfying, after so long, to see some actual development in more minor characters, and these revelations just add fuel to the fire over the rumours about a possible Black Widow stand-alone movie. The infinity stone plotline is fleshed out a little more as well. Having seen the Tesseract, the Aether and the Orb, Age of Ultron features the Sceptre and a little more about who can successfully look after and wield the power of the stones. While thoroughly enjoyable, Age of Ultron isn’t wholly without fault. Thor’s long-awaited return to Midgard is glossed over a bit, with a couple of throw-away lines about retrieving Loki’s Sceptre. After Iron Man 3, which depicted Tony Stark as mentally broken and suffering heavily from Post-Traumatic Stress Disorder, Iron Man is as funny and free-spirited as he’s always been, the character changing very little from his last appearance in an ensemble performance. As is the infinity-stone plotline which started with Avengers Assemble and cropped up again in Guardians of the Galaxy.